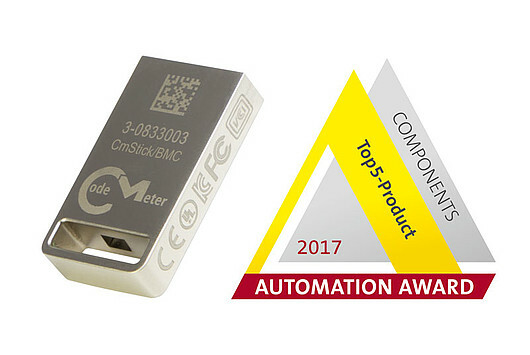 CmStick/BMC, the latest generation of Wibu-Systems’ hardware elements for the secure licensing of digital know-how, is one of the five nominees for the 2017 Automation Awards, the most prestigious prize to be won in the automation industry. Visitors of SPS IPC Drives, Nuremberg, Germany, can learn more about the shortlisted products and vote for the winner of their choice. Unlike the safe world of the office, industrial environments are no stranger to extreme conditions and rough handling. With CmStick/BMC, Wibu-Systems steps up to meet the needs of intelligent device manufacturers even more and introduces new innovative components in the architectural design for an extremely compact and elegant layout. The SiP (System in Package) technology that was adopted for this most recent dongle is an absolute novelty that provides a new level of robustness. With recent advances in miniaturization, the USB connector no longer projects from the body of the unit, but has become an integral part of the case itself. This new engineering approach shrinks down the overall size of the dongle to become the smallest model with flash memory available in the world market, and makes it resistant to pressure, vibrations, and humidity. Like all other secure hardware elements in the CodeMeter product lineup, the CmStick/BMC embeds the most sophisticated smart card chip from Infineon, the SLM97, a security controller optimized for industrial M2M applications that offers exceptional endurance over an extended temperature range to suit ruggedized industrial environments and usage conditions. This new breed of dongles is available with 16 GB 2-bit MLC (multi-level cell) flash memory. For faster data transfer, the unit is equipped with a USB 3.1 interface; for more reliable data retention, the dongle relies on Hyperstone’s U9 flash controller and their patented hymap© firmware; for even greater data security, an encrypted partition - Secure Disk - is enumerated and handled with CodeMeter API, while it remains invisible to regular users. The product will be on display at Wibu-Systems’ exhibit, hall 7, booth 660, as well as in hall 3, booth 260, where Konradin, the renowned German publishing house that is holding the reins at the Automation Award, will showcase all nominees in the two categories, Control Technology & System Solutions and Standard Components & Sensor Technology. A jury made up of scientists, representatives from the VDMA (the German Engineering Federation), and ZVEI (one of Germany’s major manufacturers’ association), and the editors of the elektro AUTOMATION magazine, have led the selection process this far. Visitors of SPS IPC Drives can now learn more from the vendors and cast their vote at the trade show itself. Oliver Winzenried, CEO and founder of Wibu-Systems, is thrilled by the plaudits the new technology has already won: “Pre-series production of CmStick/BMC has just started, and we already have customers on our waiting list for the additional batches that are being readied. When you pioneer a field, the design and manufacturing processes are quite challenging; it’s the result you envision that drives all the necessary efforts. With this new security device, we invite system integrators, machine builders, and plant operators to take control over their digital assets using existing and cutting-edge technologies that monetize their business by leveraging effective cybersecurity measures”.